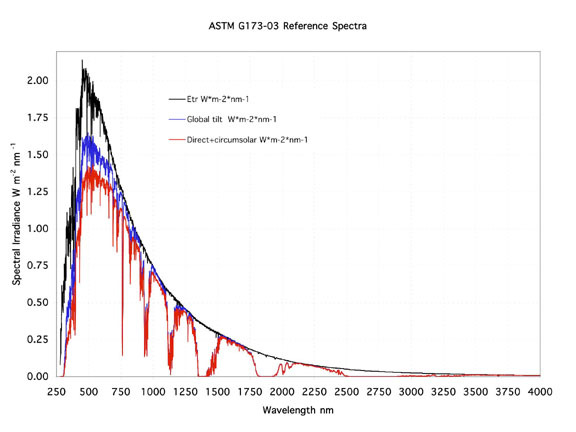 The AM 1.5 Standard Spectrum refers to exactly two standard terrestrial solar spectral irradiance spectra. The two spectra define a standard direct normal spectral irradiance and a standard total (global, hemispherical, within steradian field of view of the tilted plane at from horizontal) spectral irradiance. The direct normal spectrum is the direct component contributing to the total global (hemispherical) spectrum. The current Standard Reference Spectra are both incorporated into a single document, ASTM G-173-03. They are available for download from NREL at this link. The figure below (from NREL) shows the extraterrestrial (AM 0), global tilted, and direct normal spectra, respectively.